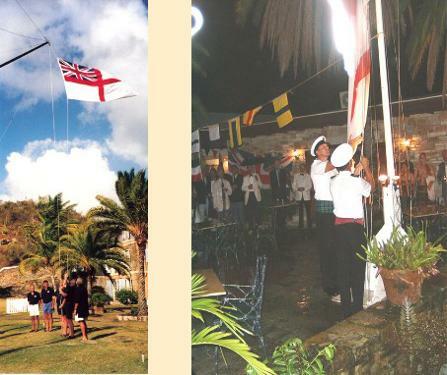 The Royal Naval Tot Club of Antigua & Barbuda has an international membership from many different nations. It is only in Antigua that a person can become a member. Many members return each year to Antigua particularly around the time of the anniversary of Horatio Nelson's victory over the French and Spanish fleets at Trafalgar on 21st October 1805. Members meet every evening throughout the year to listen to readings from Royal Navy history and toast Her Majesty, the Queen. There is a different toast for each night of the week. The Tot Club is involved in raising funds for charitable causes, promoting Antigua particularly in the yachting sector and, on Sundays the 'Keep Fit' class clears trails through the National Park and fights back the tropical undergrowth from Antigua's historic monuments. Sunday - To Absent Friends and those at Sea and the Queen, God Bless Her. Monday - To Our Ships at Sea and the Queen, God Bless Her. Tuesday - To Our Friends and the Queen, God Bless Her. Wednesday - To Ourselves as no one else is liable to concern themselves with our Welfare and the Queen, God Bless Her. Thursday - To a Bloody War and a Sickly Season, to a Bloody War and a quick Promotion and the Queen, God Bless Her. Friday - To a Willing Foe and Sea Room and the Queen, God Bless Her. Saturday - Sweethearts and Wives, May they Never Meet and the Queen, God Bless Her. To the Wind that Blows, the Ship that Goes and the Lass that Loves a Sailor and the Queen, God Bless Her. There are Wood Ships and there are Good Ships and there are ships that go to sea but the Best Ships are Friendships and may they always be and the Queen, God Bless Her. To the Queen, God Bless Her. There is both an annual and a daily subscription. The annual subscription is to maintain a member's membership of the Club however, anyone attending the daily readings and Loyal Toast is obliged to pay, in addition, for daily attendance. Members wearing the Club T-shirt on Saturday pay a reduced daily subscription. The Club T-shirt bears the Saturday Toast. Any Member [and his/her Guest(s)] arriving after the Rum Bosun has called 'Book is closed!' (nominally at 1800) will only be permitted to join the Tot at the discretion of the Rum Bosun. A one minute warning will be given before the book is closed. No Member or guest will be permitted to join the Tot after the Rum Bosun has greeted the assembled Members with the words 'Good evening, Ladies and Gentlemen'. This greeting will be followed by the introduction of Guests (if any), the day's announcements then readings from this day in Royal Navy history according the date. Proceedings are concluded with the Loyal Toast. 3. The 'phone of a Member or his/her Guest's should ring at any time in the circle from the Rum Bosun's greeting until after the Loyal Toast. 4. A Member or his/her Guest should be found smoking in the circle at any time from the Rum Bosun's greeting until after the Loyal Toast. 5. In the event that a Member's Guest, having been informed that he is required to consume a full Tot (or a half Tot in the case of a non-joining lady guest) fails to consume the said amount of rum within a reasonable time of the Loyal Toast having been given. There are four grades of Membership - Full Members who are the Directors of the Tot Club and are restricted to a maximum of ten - Associate Members who are Members who have been recognised as making a significant contribution to the Club - Honorary Members who are either retired Full Members or persons of note who are invited to join the Club as Honorary Members - Members (and Overseas Members) which comprises all other members. 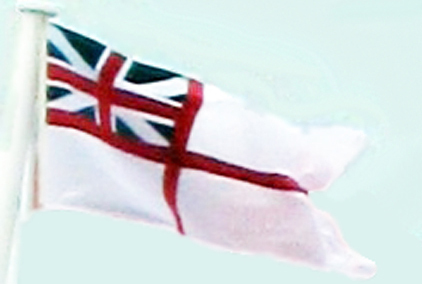 Until 2003 all members who were not Full, Associate or Honorary were designated Overseas Members and those who joined before that date still hold that title however, with an increasing number of 'Overseas Members' living in Antigua, the Overseas was dropped and all subsequent Members are known just as Members. A Member may invite up to two Guests per day although with the consent of a Full Member and under special circumstances, such as a celebration, a Member may invite a greater number of Guests. A Member must pay a daily subscription for each and every Guest. The Guest is not permitted to pay the daily subscription. Members must advise their Guests that they are required to drink a full Tot (1/2 a gill). Lady Guests may drink a half measure. All aspiring members (lady or gentleman) must drink a full Tot. 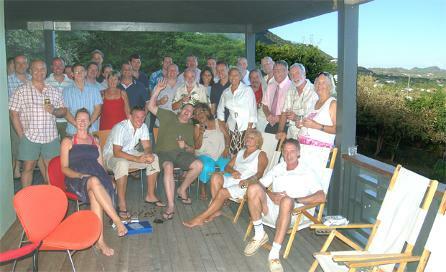 An aspiring member must be invited to join by an existing Member and can only join the Tot Club in Antigua. An aspiring member will be required to drink an introductory Tot followed by seven full Tots within 14 days. The Member hosting an aspiring member must pay the aspiring member's daily subscription. The aspiring member is not permitted to pay his/her daily subscription. After the sixth Tot, an aspiring member must take a verbal test on Royal Naval history. A tutoring paper is given to each aspiring member after his or her third Tot. The pass mark is 75%. Upon successfully completing the joining routine a new Member is required to call a Mismuster and invite those present to join him or her at a Tot. Any Member wishing to rejoin and whose subscription has remained unpaid for 1 or 2 years shall pay the for the number of lapsed years. Any Member whose subscription has lapsed for 3 or more years shall have the choice of paying 3 years subscription or doing 7 Tots within 14 days, all Tots to be paid for by the lapsed Member. The Rum Bosun to introduce the lapsed Member as rejoining. Upon completing the 7 Tots the lapsed Member will not be required to retake the new Member's test on Royal Navy history. In addition to calling a Mismuster at the time of joining, a Member may call a Mismuster with the approval of a Full Member if he or she has a good reason for having missed the Tot or has another good reason to call a Mismuster such as a celebration. The Member calling the Mismuster is required to pay the full daily subscription for himself/herself and half the daily subscription for each and every person he or she invites to join the Mismuster. Black Mass is served every Sunday approximately 45 minutes after the Tot to those persons who attended the Tot and any person who, for no fault of their own, is unable to attend the Tot. The celebration of Black Mass is the honouring of the 'illegal' Royal Navy tradition of consuming surplus rum left over from the daily tot. 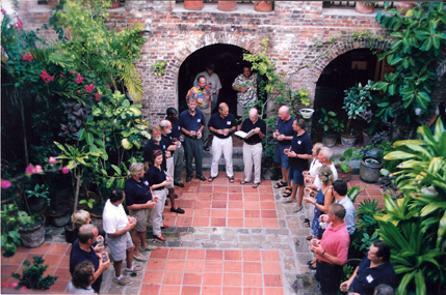 Readings from Royal Navy history taking place in the courtyard of the Copper & Lumber Hotel in Nelson's Dockyard. 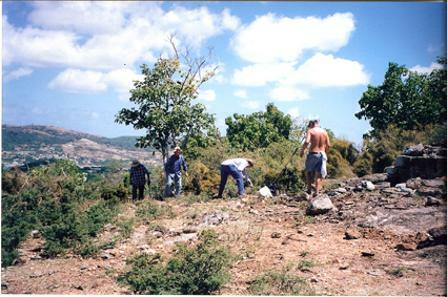 Tot Club Keep Fit - Destroying Nature to Preserve History and keeping the Trails in the National Park open to the public. Tot Club Members entertaining the Officers of HMS Iron Duke including HRH Prince William.